The garrison colonial style house at 111 Glen Drive sits on a 1.3-acre level and sloping property. NEW CANAAN — Behind the garrison colonial house at 111 Glen Drive sits the New Canaan Field Club, a members-only facility on Smith Ridge Road that offers tennis and aquatic programs and activities in three seasons, and social events year-round. The club features “ten Har-Tru tennis courts, four lighted platform tennis courts, a large 25-meter, six-lane swimming pool with diving well, a wading pool and playground for young children, an idyllic pond, and various social pavilions for entertaining,” according to its website. Occupants of this 3,890-square-foot house can benefit from the Field Club’s proximity should they become members, but they need not be distracted by all its activity. The club and the house are both set on beautiful wooded grounds, the thick stand of tall, mature trees serving as a buffer between the two. Not a family of tennis players or swimmers? Maybe soccer is the sport of choice. This house sits on a 1.3-acre level and sloping property. Its top tier is flat and large enough to create a soccer field, or to play other sports and lawn games. The attractive topography also provides an opportunity to create tiered rock and perennial gardens. The landscaping is attractive as it is, but would really flourish if the next owner has a green thumb. For those who prefer just to relax, this is the place to do it — a quiet and private setting at the end of a cul-de-sac. Relax on the rear stone patio, sit around the fire pit or entertain guests in this attractive oasis. Although the house was built in 1967 as a colonial, not a contemporary, it has an open floor plan perfect for today’s lifestyle. Its location also augments modern living. 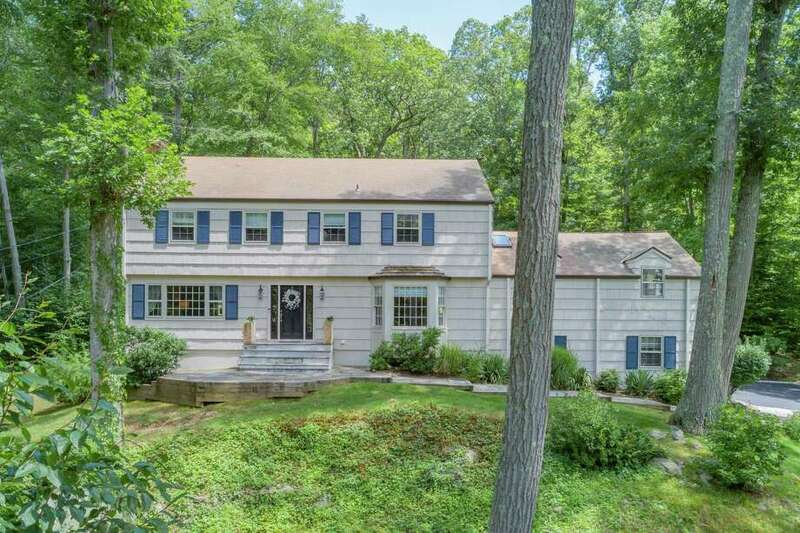 The house is only minutes from the center of New Canaan and the downtown Metro- North train station, and the Merritt Parkway is a few short miles beyond that. To reach the freshly painted beige house with navy blue shutters travel up the new driveway lined in Belgium block to the slate path with wood rail trim, which leads to the front door flanked by tall sidelights. Inside, the sizable foyer provides access to the formal dining room to the right and the formal living room to the left. In the dining room there is wainscoting on the lower walls and a bay window. The front-to-back living room has a marble fireplace. At the back of the room there are French doors that separate it from the renovated gourmet eat-in kitchen. Features in the kitchen include stainless steel appliances including a Sub-Zero refrigerator and Thermador cooktop, a motion-sensor faucet, ample granite counters and glass-front cabinetry with interior lighting for display of dishware. In the eat-in area there are sliding glass doors to the spacious all-season sunroom. The sunroom has a door to the backyard. At one end of the main living level there are four steps up to the spacious family room above the two-car attached garage. This room has a cathedral ceiling, exposed beams, ceiling fan, skylight, built-in shelves, and a section of wall and ceiling with greenhouse glass windows. On the second floor there are four bedrooms. The master suite has a walk-in closet with organizers and in the updated bath there is a double marble vanity and a large shower. The other bedrooms share a hall bath. It also has a double vanity. In the full partially finished walk-out basement there is a large play or game room with a red brick fireplace, an exercise room, ample storage spaces, laundry room with a utility sink and a half bath. The bath was added to the lower level in 2017. The game room has a door to the side yard. There is room in the basement for a fifth bedroom, if necessary. For information or to make an appointment to see the house, contact Susan Leone of Higgins Group at 203-209-2075 or susan@susanleone.com.